A postponement is when the couple have decided that they are still having wedding services with Gatlinburg’s Little Log Wedding Chapel but cannot keep the current reservation and would like to reschedule for a different date. Rescheduling must be done within one year of postponement date and any remaining balance must be paid at the time of rescheduling. All payments will be applied; however, a replacement fee may incur for items such as cakes, fresh flowers, personalized items, etc. Only the couple named on the Wedding Confirmation Letter are authorized to make a postponement. We must have written documentation of any postponements and a signed Wedding Confirmation Letter in order to process any postponements. There is a $50.00 fee for each additional postponement or change in date. All weddings and services are non-transferable. A cancellation is when the couple have decided they are not going to be getting any wedding services through Gatlinburg’s Little Log Wedding Chapel. In the event of cancellation, 25% of the highest total package price is non-refundable with a $100.00 non-refundable minimum. Any additional payments will be refunded to the current credit card on file. Cancellations made within 30 days prior to the wedding date will not be issued any refunds. Only the couple named on the Wedding Confirmation Letter are authorized to make a cancellation. WE MUST HAVE WRITTEN DOCUMENTATION OF ANY CANCELLATIONS AND A SIGNED WEDDING CONFIRMATION LETTER IN ORDER TO PROCESS ANY REFUNDS. 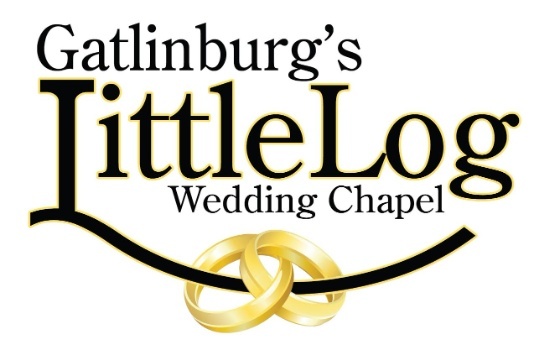 GATLINBURG'S LITTLE LOG WEDDING CHAPEL'S ENTIRE LIABILITY FOR ANY CLAIM, LOSS, DAMAGE, OR INJURY ARISING UNDER OR RELATING TO THIS AGREEMENT IS LIMITED TO THE FEES PAID BY CLIENT FOR THE SERVICES. Please note that for future payments, we accept all major credit and debit cards, cashier’s checks, and money orders. We do not accept personal checks. All payments are to be paid in full 30 days prior to the scheduled wedding date. Unless other arrangements are made, the credit card on file will be charged the balance of the wedding 30 days prior to the wedding date. Failure to make payment arrangements will result in the cancellation of the booking with no refunds or credits. We request that the wedding package be finalized 30 days prior to the wedding date. We also ask that any changes be made in writing. We cannot guarantee that any changes will be made within 30 days prior to the wedding date. You must be at least 18 years of age. Both parties must present either a Valid Driver’s License or a Certified Birth Certificate. If you are not a U.S. citizen, you will need to present a valid Passport. If your Social Security number is not shown on your Driver’s License, you must bring your Social Security Card. You may view additional information online by clicking this link. If you scheduled your lodging with us and it is not included in your wedding package above, it was booked separately through Little Log Vacation Rentals. Quotes are frequently given at the office to include both but they are two separate companies; therefore, they are frequently processed as two separate reservations. Little Log Vacation Rentals will attach a Rental Agreement to your Client Profile (separate from your Wedding Confirmation Letter) that will also need to be electronically signed whether your lodging is included in your package or has been booked separately. Please contact Little Log Vacation Rentals at littlelogvacationrentals@gmail.com for any questions or concerns about your rental. If you have not done so, you may contact our office and schedule a formal rehearsal for $150.00. Otherwise, the minister/officiant will speak with the couple separately just before the ceremony. For a formal rehearsal: Please provide the included directions and GPS warning to your wedding party. Arrive at the chapel about 15 minutes prior to appointment time. Rehearsals run smoother when only those participating in the ceremony are present. Please bring any items that your wedding coordinator may need for your ceremony; such as, special music, candles, guest books, sand kits, etc. If you are using our minister/officiant and have already been issued your marriage license, please bring it with you. Please keep in mind that the prices are based on the number of guests that we have previously quoted. If your guest list changes in any way, please let us know as soon as possible. Everyone but the couple are considered as guests. Guests added prior to the wedding day are $10.00 per person plus fees for additional time, if needed. If more than the allotted amount of guests arrive on the day of the wedding, there will be a $15.00 charge per person automatically charged to the card on file. The amount of guests strongly affect the amount of time needed as well as chapel staffing and set up. We recommend planning on the most amount of guests possible as it is always easier to reduce time than add to it later. We will seat all guest 10 minutes prior to the ceremony. It is very important that everyone attending be on time. We are unable to wait on late arriving family and friends. There is absolutely no drinking of alcohol permitted on the chapel property unless otherwise approved by the chapel staff. All chapel decorations are to remain as they are unless previously approved and purchased through the chapel office. If you choose to provide your own flowers for bouquets, boutonnieres, and/or corsages, please designate a person to be in charge of pinning and overseeing that the proper people receive their flowers. That person should arrive to the chapel with the couple. Please have all flowers arranged when they arrive at the chapel, we will not wait for anyone to arrange flowers nor do we supply additional supplies or tools. Inform your wedding coordinator of any items not provided by the chapel that you are bringing for your wedding day. Please bring these items to the chapel, if at all possible, the day prior to your wedding. (Guests Books, Memorial Items, Music, Bouquet Charms, Signs, etc.) Items which require a display table may incur an additional fee(s) and will automatically be charged to the card on file. All frames must be self standing. We ask that the couple and any attendants (attendants and guests must come dressed) arrive at the chapel 30 minutes prior to their scheduled wedding time. We also request that the couple arrive with hair and/or makeup completed. Dressing rooms will not be available after the ceremony nor are they available for guest or attendants. The minister/officiant will rehearse with the couple, separately, along with the wedding party prior to the ceremony. Remember that you are required to bring a Tennessee Marriage License. We will start on time if the couple are present and dressed. It is not possible for us to wait for late family and friends. Please make sure that any attire, Marriage License, and rings arrive with the couple. You will not be allowed to travel back to your place of lodging for these items. If you would like to leave a gratuity for the minister/officiant, an envelope will be provided. All photographic images remain the property of Gatlinburg’s Little Log Wedding Chapel and may be used for any promotional purposes. You must let your photographer know if you DO NOT want your photos used for these purposes. Your photos will be placed on a secured website for viewing. If you have certain photos that you want taken, please contact the photographer prior to the wedding day. Guests are allowed to take photos during the wedding, without flash and from their seats. They may also take photos outside after the photographer has completed their photo session. We do not allow guests to follow or shadow our photographer during your photo shoot as this is how they make a living and provide for their families. Photographers take roughly double the amount of photos in your package so that you may choose from a selection. Packages include unedited photos in JPEG format unless otherwise specified; however, special edits may be purchased separately. Our physical address is not compatible with all navigational devices. We strongly request that you send your guests the following directions or alternate directions from our website under "About Us" along with our telephone number in order to ensure their arrival to your wedding. If anyone has problems with directions on the day of the wedding, please direct them to call: 800-554-1451. Call the office for alternate directions to avoid high traffic areas. From Exit 407 to Gatlinburg. Once in Gatlinburg turn left at traffic light #3 onto Highway 321. Travel down Hwy. 321, 2.9 miles and turn left at traffic light #3A onto Glades Rd. Once on Glades Rd. travel 2.5 miles to the chapel on the left. We are a resort area and traffic is very heavy at times throughout the year, particularly on the weekends. We ask that you allow the appropriate travel time especially when coming from Pigeon Forge or outlying areas. Also, caution your guests about potential traffic issues. In the event of a late arriving couple, we may be forced to move the wedding to a later time that day or even the following day. Please contact our office for alternate directions to avoid high traffic areas. You may use outside vendors in place of services provided by the chapel. The chapel will not take responsibility for any problems that may occur as a result of the use of those vendors. These vendors will need to sign a contract with our chapel, prior to your wedding day, to ensure that they are aware of our policies and acknowledge that they understand said policies. Your minister/officiant will be required to submit an order of service to our office. There is a standard flat fee for all weddings providing your own minister/officiant. An additional fee may be required if more time is needed to fulfill these obligations. During winter months, four wheel drive or chain equipped vehicles may be needed. We do not offer discounts or refunds if you or our staff is unable to arrive to your unit or chapel because of weather related conditions. However, we will be happy to reschedule at a time that is convenient to you. Reordering fees are applicable for perishable or personalized items that are in your package (flowers, cakes, engraving, etc.) We will contact you in advance if we know that inclement weather will be a factor in that days wedding. We may also consider rescheduling the time later on that day. Absolutely no animals are permitted without prior approval from the chapel staff. A non-refundable pet deposit of $50.00 per animal will be required. In the event of damage, or the need for excessive cleaning, the couple will be responsible for a $150.00 cleaning fee. Charges may also exceed this amount depending on the extent of damage. There is no food or drinks of any kind allowed in the chapel. Alcohol and tobacco products are prohibited in or around the chapel unless previously approved by chapel staff. Gatlinburg’s Little Log Wedding Chapel is not responsible for lost or stolen items. Guest’s items which are found will be returned to the chapel office. Items can be returned at the guest’s expense.